Shah Rukh Khan shares a great bond with his children, be it Suhana, Aryan or AbRam. King Khan is the happiest when he is surrounded by his loving family. He took to Twitter recently and shared a picture of Aryan and Suhana. Both of them were seen sporting limited edition Taxi hoodies from Helmut Lang’s collection and can be spotted at a Road crossing. 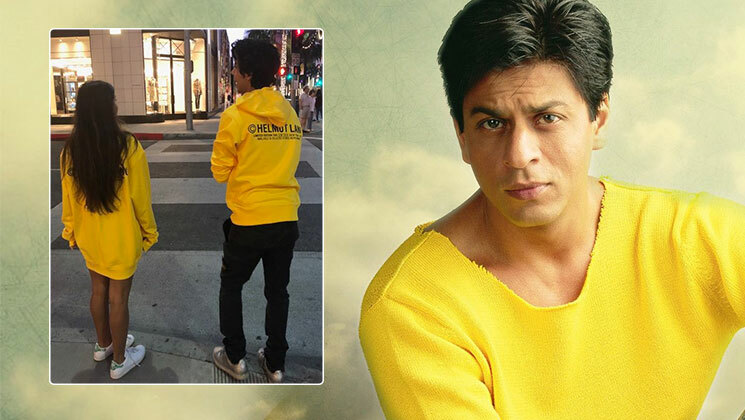 SRK wrote with the picture, “This image reminds me of the Yellow Brick Road… I hope they find answers they are looking for or at least have enough questions to lead a full life… #mysunshines,” wrote the 53-year-old superstar. Shah Rukh’s ‘Yellow Brick Road’ could be a symbolic reference to the road mentioned in The Wizard Of Oz, which was symbolic of a journey full of riddles and surprises for the fiction novel’s main character ‘Dorothy’, who set out in search of the titular wizard. This ‘Yellow Brick Road’ reference in the quote is symbolic to the wishes the Khan is sending for his children for their happy life ahead. Not many know that Shah Rukh Khan in 1983 was cast as the wizard in a play titled ‘The Wiz’ for a school performance while he was at New Delhi’s St Columba’s School. Shah Rukh was about 18 at that time. Shah Rukh Khan’s children will soon be marking their Bollywood debut as soon as they finish education. Suhana is pursuing higher studies at Ardingly College while Aryan is currently studying films at the University of Southern California. Shah Rukh and his interior designer wife Gauri are also parents to AbRam, the youngest of the three Khan kids. Let us wait and watch which of SRK and Gauri’s child will first mark their Bollywood debut.